Probably the most important part of any radio broadcast or recording, is the ability to capture a voice. So we know that when we speak, vibrations in the voice box create a pressure wave in the air, this travels through to cause vibrations in your ear, and they are then converted into electrical signals, and fed to the brain where they're decoded. Dave - The first kind of microphone which was practically used was developed by Edison in the 1880s to work with the telephone, and that was based on having a little pot full of carbon granules. You apply a voltage across those carbon granules, and you get a current out. Now if you shake that using the sound wave which is coming from your voice, that will change resistance of those carbon granules, so that will change the current going through it and you have an electrical signal. But the problem is, the resulting electrical signal is horrible and it gives a very, very bad rendition of the sound it was producing. But it was very cheap and you didn't need to amplify it, so it's very useful in the early days. Ben - How did people take those ideas and build on them? Dave - The next big improvement in microphones was done by a guy called Wente based in Bell labs in 1916 and I'm going to build a model of that now. This is based on the principle of capacitance. I've got a piece of tin foil and if you apply a voltage of that tin foil, some current will flow into it, a tiny, tiny amount, a little tiny bit, and it might become negatively charged. Now, if you apply the opposite voltage to the second piece of tin foil then that will become positively charged and for a certain voltage, a certain amount of charge will flow from one plate to the other, so we say the system has a certain capacitance. Ben - But if you allow those two bits of tin foil to touch then presumably, the current will just flow from one to the other and instead of having a way of storing energy, a capacitor, what you've got is just a very poor circuit. Dave - That's right, so we don't want to do that. So, I'm going to separate these two pieces of tin foil with a piece of cling film which is a really good insulator. 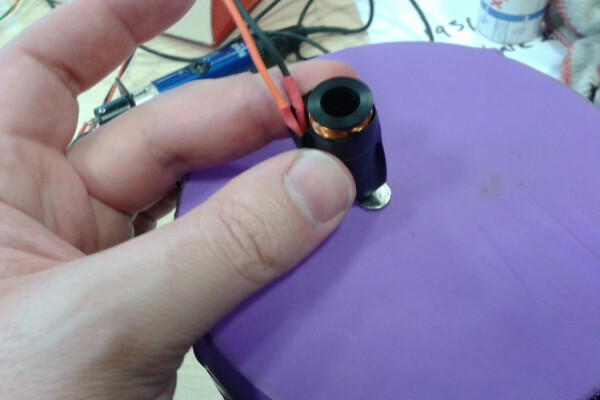 Ben - So what we now have is a very basic model of the standard electrical component which is a capacitor, and that is capable of storing a small amount of charge, but that still doesn't look to me like it can collect sound from the environment and turn it into an electrical signal. Dave - The way it does this is a property of capacitors. This is because if you got the two plates, a positive plate and negative plate very close to each other, they stabilize each other. The positive plate attracts the electrons in the negative plate and so, the voltage you need to push electrons in gets lower, so you can get more charge on for the same voltage, and we say has a higher capacitance. The closer those two plates are together, the higher the capacitance is. So, if the plates move backwards and forwards, the capacitance is going to change up and down. Ben - So, in order to turn this into a microphone, we need to find a way of changing the distance between the two. Is that as simple as shouting at it? Essentially, we put a vibration in it from our voice that changes the distance between the two plates, and that gives us a model of that sound wave in the changing electrical current? Dave - That's what I intend to do, yes. Shouting is going to be involved. As the sound waves hit it, they're going to move the plates together and apart. The capacitance is going to change, so the amount of charge on those plates is going to change, you get a current flowing in and out, which it should be able to detect as an electrical signal. Ben - So, we're wiring up our 2 pieces of tin foil and a piece of cling film now. I would be amazed if it does work. Dave, over to you, what's next? Dave - Well I've now got this connected to our recorder so we should be able to listen to it later. I'll give it a go. I might speak quite loudly because my experience is this is not the most sensitive microphone in the world, but let's give it a go. Ben - Okay, hold on. I had better stand back if Dave is going to be shouting. Dave's voice is loud at the best of times. Off you go then, Dave. Dave - So I'm now shouting very loudly at this capacitor based microphone! Ben - Let's have a listen and see what it sounded like. Dave - So I'm now shouting very loudly at this capacitor based microphone. Ben - Well, that is noisy and your voice was quite quiet despite you shouting very, very loudly, but it worked. So clearly, this demonstrates the principle, but why was it so noisy? Dave - One of the problems is that my microphone is also actually quite a good aerial and it will pick up any electrical interference going on in the room. So, to improve this we'd probably want to put it in a metal tub and earth the outside of that metal tub to give it a bit of protection against the electric fields moving about. If you build this really well, it produces a decent microphone. Though in 1931, the same guy, Mr. Wente, (he seem to have invented most microphones in the world), developed a slightly different technology for microphones called the dynamic microphone, and we can actually have a go at building one over here. Ben - So, a dynamic microphone, if I remember rightly is the type that you'll see most singers using on stage, but how does it differ? Dave - So, this is going to do the same thing as the capacitor based microphone. It's going to take a vibration from the air and turn it into an electrical signal. But it's doing that conversion differently. This works on the principle called electromagnetic induction and you may have done this at school. All you have to do is take a coil of wire which I've got here and if you take a strong magnet and wave it near the coil of wire, you'd generate a voltage. Ben - How do you capture the sound wave and make it wave a magnet next to a coil? Dave - Essentially, you've got to turn the movement of air into a movement of a physical object and a good way of doing that is essentially make a drum skin because that can be easily moved by the air, so I've got a drum skin here. And if you just feel that with your finger and I talk into it, you can feel the vibration. Ben - Yes, so I can feel the vibration in my finger. What we've basically got here is a plastic tub with a bit of balloon rubber stretched across the top. So that's a good way to collect that vibration and then how do we put that into a magnet that goes into the coil? Dave - We've got to somehow attach either the magnet or the coil to this and keep the other one of them still. I've connected the magnet to it. All you need to do now is get a coil and wire it up to your recording device. Dave - So, this should hopefully be recording something marginally useful and it's basically just shouting at a magnet and a drum skin! Ben - And now, let's have a listen back. Dave - So, this should hopefully be recording something marginally useful and it's basically just shouting at a magnet and a drum skin. Ben - So again, very noisy, but it's clearly you and I can pretty much understand what you're saying there. Now, microphones come in all different shapes and sizes, and from the tiny little lapel ones, through to the big fluffy ones that they use for recording people on film sets, are they all based on the same technology? Dave - Most microphones are now based on the development of the capacitor or they're called condenser microphone and there are some more exotic types of microphone. You get strange kind of piezoelectric microphones based on the same principles as a gas lighter, the clicky gas lighters. And basically, if you can think of a way of converting a vibration into electrical signals, someone's probably trying to make a microphone using it. How much force does it take to snap the femur?